While Cauliflower boils, preheat a large skillet over medium high heat. Add oil to hot pan and chopped bacon. Cook until its nice and crispy about 8 minutes. when done place them on top of a paper towel on plate to drain access fat. Keep and bacon drippings in the skillet. Now add chopped onions season with salt and pepper. (Tip: Carmilzing faster add 1/2 teaspoon of sugar). Onions should take about 10 minutes or so. Add meat to carmilized onions and break the meat up and cook for another 5 to 8 minutes. Add carrots,sweet peas and thyme to the meat. Cook veggies with meat 5 minutes, stirring frequently then add beer. Add 1 tablespoon of flour sprinkle it on and stir. I’ve never tried shepherd’s pie with mashed cauliflower. I’ll bet it’s good. Rosemary is my “go to” herb so that jumped up at me. Big Shepherds Pie fan here and love making it with different ingredients, even vegetarian. 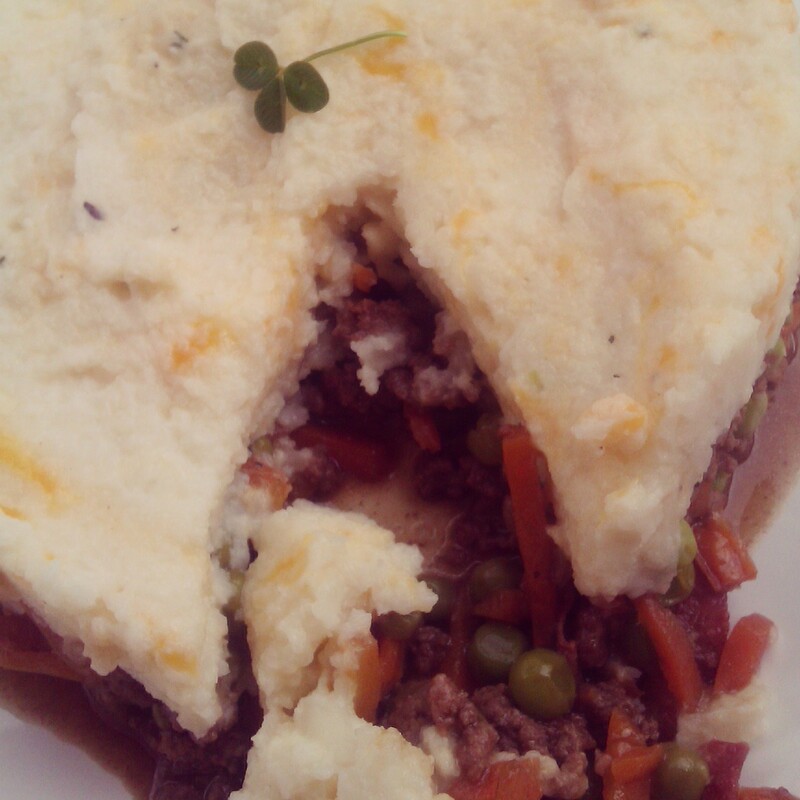 Thinking a Corned Beef Shepherds Pie for St. Patrick’s Days may be on my agenda this weekend! I’ve been looking for a Shepherds Pie recipe to make…yours looks so yummy i think i will have to try it! 🙂 Thanks!